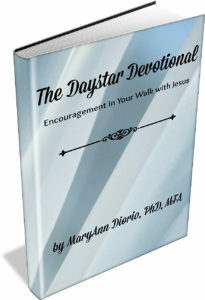 The Daystar Devotional was published for five and a half years, from mid-2000 to the end of 2005. I am so thankful to be able to offer these devotionals to you here, free of charge, for personal use only, to bless you and those with whom you share them. I ask only that you obey International Copyright Law by forwarding the link to the entire page, including the Copyright notice at the end of each devotional. Thank you for your kind cooperation in this legal matter. These devotionals may not be published in church bulletins, newsletters, magazines, or online publications, including blogs, websites, etc., or in any other place or by any other means, without the written permission of Dr. MaryAnn Diorio. To do so is, under the law, considered stealing and subject to legal prosecution and punishment. Thank you for your cooperation. For permission to use in your publication, please contact Dr. MaryAnn Diorio at info@maryanndiorio.com. A minimal reprint fee of $5.00 will be charged for one-time reprint rights. *One-Time Digital Reprint Rights for any article. Available for $5.00 through PayPal. Byline must stay intact. Link back to Article and Bio greatly appreciated! Please note: These devotionals are copyrighted by law and may not be reproduced or reprinted or published in any form whatsoever without the written permission of Dr. MaryAnn Diorio. Copies may be printed for personal use or for sharing with others. Each devotional, however, must be printed in its entirety with the copyright notice included at the end to avoid legal prosecution. Thank you for your cooperation in adhering to Copyright Law and to the standard of personal integrity. March 16, 2005 — “For the eyes of the Lord run to and fro throughout the whole earth, to show Himself strong on behalf of those whose heart is loyal to Him” (2 Chronicles 16: 9). NOTE: The Daystar Devotional ceased publication in mid-2005. June 11, 2003–“I count all things to be loss in view of the surpassing value of knowing Christ Jesus my Lord, for whom I have suffered the loss of all things, and count them but rubbish so that I may gain Christ” (Philippians 3: 8). March 4, 2002—“For I have taken Your lovingkindness and Your truth as my ideals” (Psalm 26: 3 TLB). April 2, 2001––“Let us hold fast the confession of our hope without wavering, for He who promised is faithful” (Hebrews 10:23). April 9, 2001–“And let them say continually, Let the Lord be magnified, Who has pleasure in the prosperity of His servant’ ” (Psalm 35:27). April 30, 2001–-“…do not become sluggish, but imitate those who through faith and patience inherit the promises. (Hebrews 6:12). May 7, 2001–“The entire law is summed up in a single command: ‘Love your neighbor as yourself’ ” (Galatians 5:14). NOTE: The Daystar Devotional began publication on May 31, 2000. June 7, 2000–“Whosoever would save his life shall lose it, but whosoever will lose his life for My sake, the same shall save it” (Luke 9: 24).